Our goal is not to create “set it and forget it” portfolios but rather to proactively navigate a changing cycle. Because we do our own research in house, this means we are ready to make our portfolios more defensive when our research leads us to make a change. Our goal is to invest more aggressively earlier in the cycle when prices are compelling and the future is positive and to invest more conservatively later into the cycle when prices are elevated and risks are greater. Since the beginning of the year, out of an abundance of caution – with one eye on the yield curve and another on the rising risks in the credit market - we have made important changes to lower risk. Today’s “Trends and Tail Risks” explains the changes we have made and how the yield curve, and other indicators, helps guide us in that process. One of my family’s favorite movies is “The Princess Bride.” This wonderful movie was released more than thirty years ago. One of its most memorable characters is Vizzinni, played by Wallace Shawn (pictured below). His most memorable line is “Inconceivable!” which he utters time and again when confronted by the inescapable reality of something that he did not believe was possible. The clip below is a brief montage of this colorful actor and his catch-phrase. I believe the market is a place where the “inconceivable” happens every day. So, you should never (ever!) catch our research team using that phrase. Perhaps the best example of this principle is in today’s bond market. 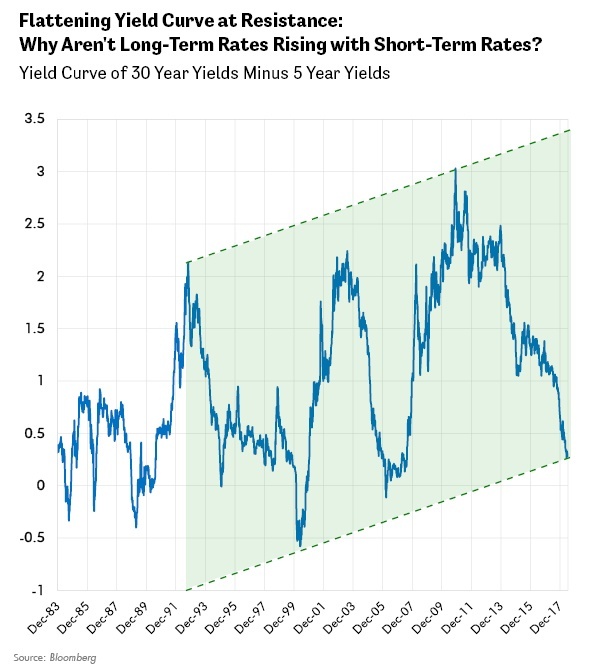 In this week’s “Trends and Tail Risks” we revisit our work on the yield curve to explain an event that many considered “inconceivable.” From there we will launch into a discussion of what we are watching in these markets and recap recent changes we have made with the goal of making our portfolios more defensive. Updating the Message from the Yield Curve: The Cycle is Aging. Quickly. We examined one of our most trusted indicators, the yield curve, a year and a half ago. We did so because our experience is that the yield curve is one of the most forward looking of all financial indicators. We studied the yield premium on the U.S. government thirty-year bond relative to that of the five-year bond. Our conclusion then, with that premium at 1.11%, was that the message of the yield curve was positive for the cycle and suggested a benign outlook for equities. And the yield curve was right! But big changes are underway in the shape of this yield curve so it's worth updating our earlier work. The updated yield curve is shown below. As the trend lines illustrate, we are now testing the extremes of what has been a very well-defined trend. In the last eighteen months, since we last published our research on the yield curve, that premium has fallen 75% to a much slimmer 0.27%. This narrowing yield premium is an important sign that the market’s expectations for the future are changing. How did we get here? What has changed? Interest rates on five-year government bonds were 1.98% eighteen months ago and, as of this morning are 2.82%, a full 0.84% higher. The yield on the US government thirty-year bond eighteen months ago was 3.09%, while today the yield on that bond is…. the same! So, the net increase in thirty-year bond yields has been exactly zero during a time when the Fed has raised interest rates by a full 1.00%! I can hear Vizzinni’s “Inconceivable!” echoed by many market observers who were shocked at this unexpected development. It shows quite clearly that rising short term interest rates do not always have to mean rising long term interest rates. But this should come as no surprise to frequent readers of this research publication, where we have often cited the valuable role that bonds play in diversifying an equity-heavy portfolio especially in the later stages of an extended upcycle. INconceivable (2.0): Bank Stocks Stop Working Despite Rising Short Term Rates. What Gives? One of the most useful disciplines that I have developed in my career is paying close attention to what “shouldn’t” be happening. One such event is playing out in the chart below. We need to talk about it. 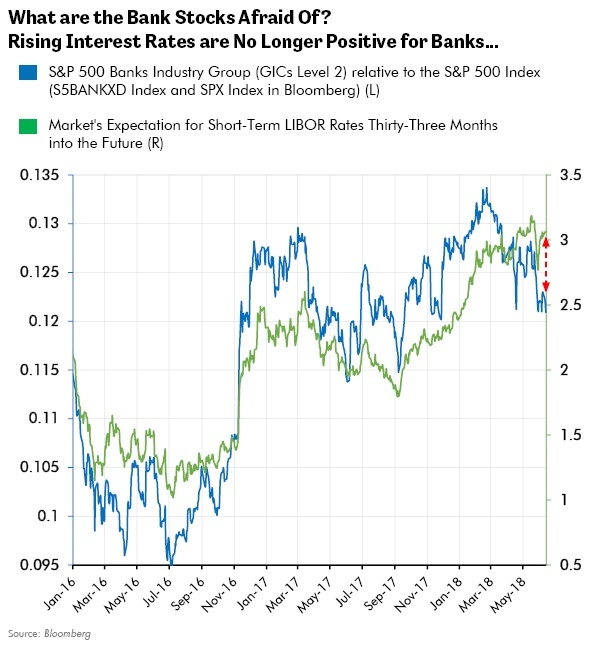 The chart above compares the trend of the market’s expectation for short term interest rates thirty-three months from now (right axis) with the performance of an index of bank stocks relative to the S&P 500 (left axis). Clearly when judging the prospects for the banking sector, the market places great weight on the expected forward path of short term interest rates (LIBOR). However, a large and we believe meaningful change appears to be underway. Bank stocks peaked relative to the market on February 21st of this year, completely ignoring the march upward in interest rate expectations that continued for another three months before peaking in the days before the mid-May collapse in the Italian sovereign bond market. We wrote about this in “Planet of the Apes” two weeks ago. Ask almost anyone why they would want to own bank stocks and the first answer you are likely to get is that banks are best to own when the Fed is raising interest rates. If that is the case, what explains the recent substantial underperformance of the bank stocks? In early April we had seen enough and moved to reduce our holdings in bank stocks, out of an abundance of caution because we were watching this worrying non-confirmation as the banks ignored “obviously” good news of rising interest rate expectations. Our focus, and perhaps that of the bank stocks as well, has been on what few others are talking about: deteriorating credit quality shown in rising prices for credit default swaps (CDS). We wrote about this in early May before the fresh bond turmoil in Italy and Europe. On January 25th we wrote “Feed the Ducks While They are Quacking” to kick off a series of risk-reducing changes that we have made in our model portfolios. Within days of its publication, volatility exploded and many asset prices plunged as credit quality began to deteriorate with a bang. Reduced exposure to lower quality corporate bonds. Increased exposure to higher quality, longer dated U.S. government bonds funded by the proceeds from selling down equity holdings in many stocks that we deemed to be fully valued, credit sensitive (such as banks) or those overly exposed to any “unexpected” slowdown. Increased our holdings in investments that we believe are more resilient during times of market stress, such as gold related equities, a leading bankruptcy advisory company in the United States, and select dividend paying companies. To try to stack the investment odds in our favor, we draw from our own hard-won lessons from nearly twenty years of professional investing and from the deep knowledge of our trusted research team. We have also come to rely on a few powerful indicators, such as the yield curve, that give us insight into where we are in the cycle. Our goal is to have the optimal mix of investments at each point of the cycle, particularly to err on the side of being conservative as we get into the later innings of what is already an extended cycle. We noted the steps we have already taken that we believe will meaningfully reduce the risk in our portfolios. Our goal is to make changes early and ahead of the news, rather than delay and run the risk of unfavorable sales at lower prices when fear and doubt are higher. This proactive policy will often lead the returns of our portfolios to look different from those of the market – for good reason. Now you know why.